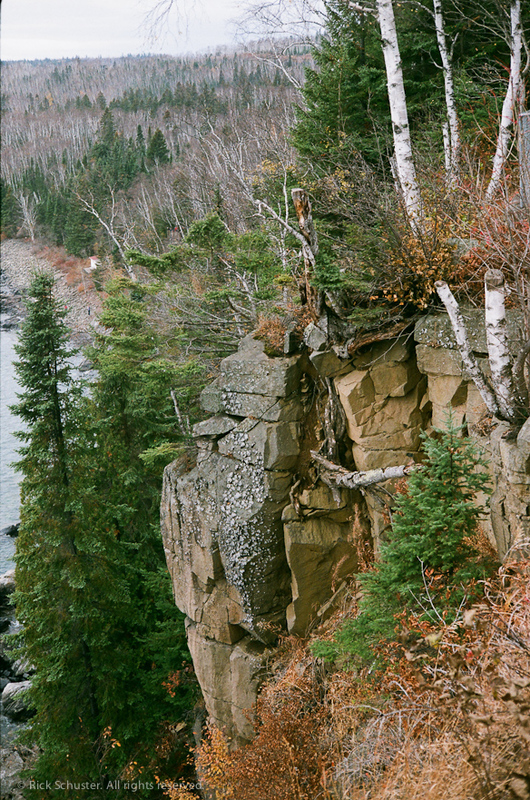 The Yashica Electro 35 was again my camera of choice to carry this past fall while vacationing along Minnesota’s shoreline of Lake Superior. In November of 1905 a single storm damaged 29 ships in this area, and prompted congress to appropriate $75,000 for a lighthouse. 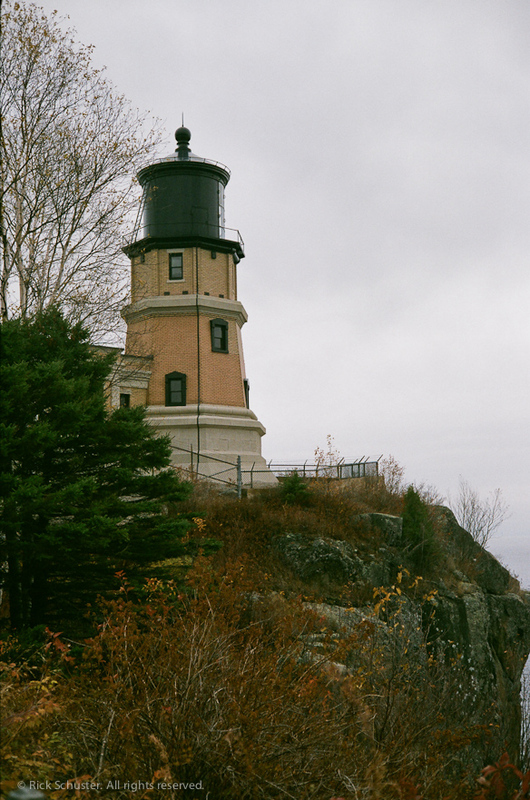 Split Rock Lighthouse began operation in 1910, and operated until 1969. The lighthouse was originally only reachable by water, and the lighthouse keepers lived in the houses built on-site. Their isolation made life difficult until the 1930’s, when a highway was built that allowed their families to come and stay with them. 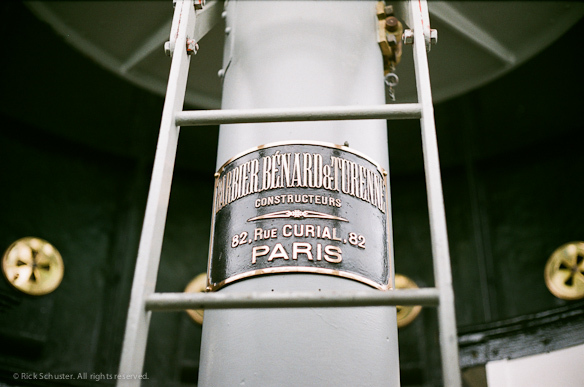 The lamp was built by Barbier, Bernard and Turenne Company in Paris, and spins by the power of a weight that was hand-cranked to the top, much like a giant grandfather clock. 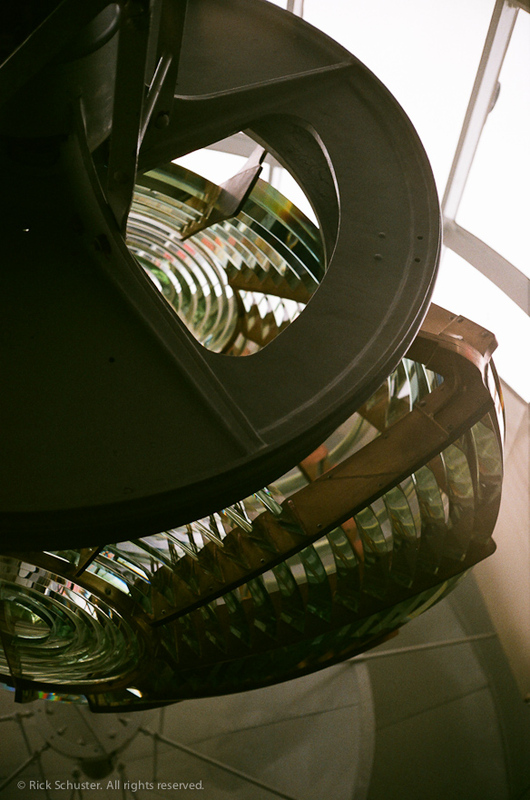 The massive fresnel lens spins easily by floating on a bearing surface of mercury. 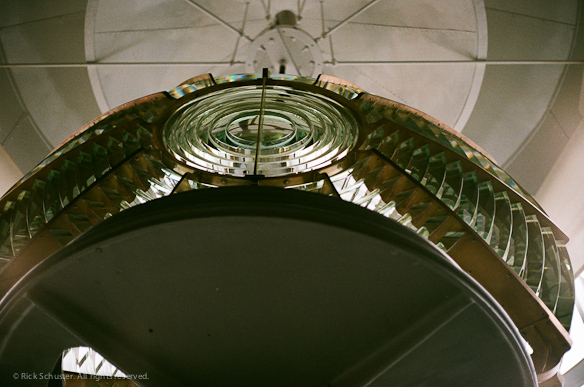 Originally the lamp burned kerosene, but it was later converted to an incandescent bulb. If you’re in the area, it’s worth stopping in for a tour. Images shot on Fujicolor Superia 200 film. Looking through some old images tonight, I came across these from a roll of black & white Fuji Acros 100 that I shot in my Rolleicord III while on a camping trip last fall in southeastern Minnesota. The original scans that Dwayne’s Photo did were a little low in contrast for my taste (though they’re great scans for the price — these are the basic $2.99 per roll photo CD scans), so I just had to do a little adjusting to the contrast and exposure to create the more dramatic look that I wanted. Not much more than I would have done in the darkroom in the old days, but a lot faster. I’m really liking the lines in that image above. As I was walking on this trail cut in to the steep hillside, I noticed the low sun coming through an opening in the trees and making that row of light colored leaves glow against the dark background. I wasn’t sure how well it would translate on black and white film, but I like the result. I like this detail shot below, as well. Composing a close-up image like this can be challenging with a twin-lens reflex (TLR) camera because the ‘taking’ lens is a couple inches below the ‘viewing’ lens. 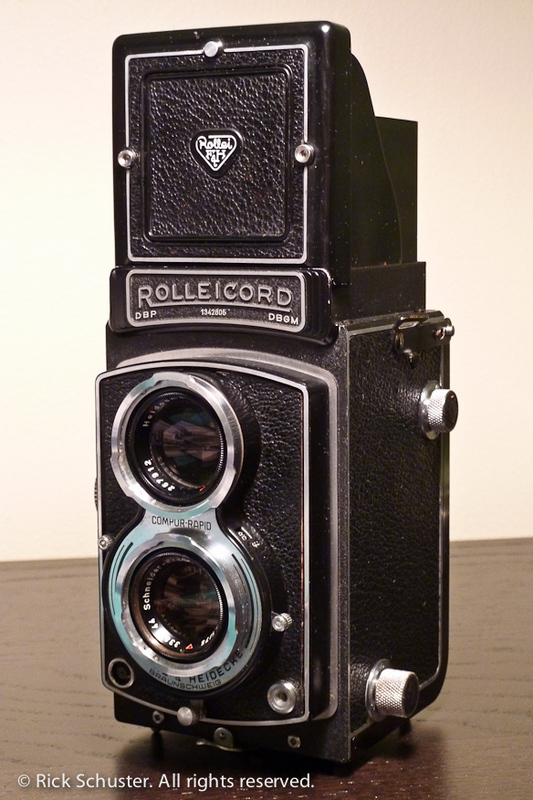 So what you see in the viewfinder isn’t exactly what will be exposed on the film. For distant shots, it doesn’t really matter, but for a closeup it can make a big difference. The focusing mechanism in this particular camera (as well as most other higher-end TLRs) compensates for parallax by angling the view of the viewing lens downward as you focus closer (I believe it’s actually just moving the mirror that reflects the image up to the viewfinder), but it still doesn’t give you exactly the same view as what you’re going to capture. I’d like to try making some large prints of the first two photos above, but now I’m faced with a cheapskate’s dilemma. 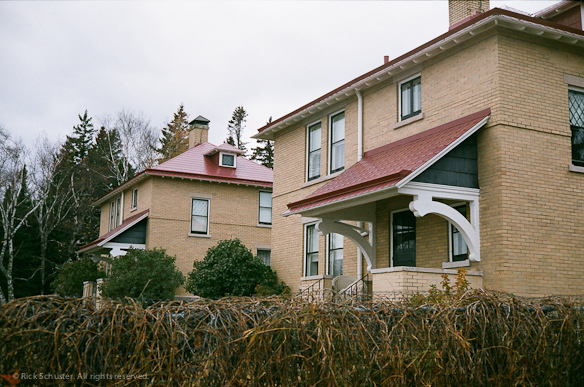 When I’m sending in a bunch of film for developing, I have a hard time spending several more dollars per roll to get high resolution scans (such as the really great $11.95 per roll ‘enhanced scans’ from north coast photo). So I usually opt instead for the lower-priced – and lower-resolution – economy scans. But then when I get an image that I’d like to make a big print of, I don’t have the resolution I need. I could probably make a good 8×8 or maybe 10×10-inch print of this, but I’d like to go larger. So maybe I’ll try scanning the 120 neg on my Epson V500 and see how that turns out. If that doesn’t work well, I’ll have to send the neg somewhere for a higher-res scan. Hmmm.